For the Libor manipulation scandal, see Libor scandal. For the personal name, see Libor (name). 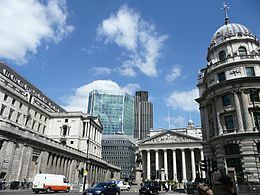 The London Inter-bank Offered Rate is an interest-rate average calculated from estimates submitted by the leading banks in London. Each bank estimates what it would be charged were it to borrow from other banks. [a] The resulting rate is usually abbreviated to Libor (/ˈlaɪbɔːr/) or LIBOR, or more officially to ICE LIBOR (for Intercontinental Exchange Libor). It was formerly known as BBA Libor (for British Bankers' Association Libor or the trademark bba libor) before the responsibility for the administration was transferred to Intercontinental Exchange. It is the primary benchmark, along with the Euribor, for short-term interest rates around the world. Libor rates are calculated for five currencies and seven borrowing periods ranging from overnight to one year and are published each business day by Thomson Reuters. Many financial institutions, mortgage lenders and credit card agencies set their own rates relative to it. At least $350 trillion in derivatives and other financial products are tied to Libor. In June 2012, multiple criminal settlements by Barclays Bank revealed significant fraud and collusion by member banks connected to the rate submissions, leading to the Libor scandal. The British Bankers' Association said on 25 September 2012 that it would transfer oversight of Libor to UK regulators, as proposed by Financial Services Authority managing director Martin Wheatley's independent review recommendations. Wheatley's review recommended that banks submitting rates to Libor must base them on actual inter-bank deposit market transactions and keep records of those transactions, that individual banks' Libor submissions be published after three months, and recommended criminal sanctions specifically for manipulation of benchmark interest rates. Financial institution customers may experience higher and more volatile borrowing and hedging costs after implementation of the recommended reforms. The UK government agreed to accept all of the Wheatley Review's recommendations and press for legislation implementing them. Significant reforms, in line with the Wheatley Review, came into effect in 2013 and a new administrator took over in early 2014. The British government regulates Libor through criminal and regulatory laws passed by the Parliament. In particular, the Financial Services Act 2012 brings Libor under UK regulatory oversight and creates a criminal offence for knowingly or deliberately making false or misleading statements relating to benchmark-setting. The London Interbank Offered Rate (LIBOR) came into widespread use in the 1970s as a reference interest rate for transactions in offshore Eurodollar markets. In 1984, it became apparent that an increasing number of banks were trading actively in a variety of relatively new market instruments, notably interest rate swaps, foreign currency options and forward rate agreements. While recognizing that such instruments brought more business and greater depth to the London Inter-bank market, bankers worried that future growth could be inhibited unless a measure of uniformity was introduced. In October 1984, the British Bankers' Association (BBA)—working with other parties, such as the Bank of England—established various working parties, which eventually culminated in the production of the BBA standard for interest rate swaps, or "BBAIRS" terms. Part of this standard included the fixing of BBA interest-settlement rates, the predecessor of BBA Libor. From 2 September 1985, the BBAIRS terms became standard market practice. BBA Libor fixings did not commence officially before 1 January 1986. Before that date, however, some rates were fixed for a trial period commencing in December 1984. Libor is widely used as a reference rate for many financial instruments in both financial markets and commercial fields. There are three major classifications of interest rate fixings instruments, including standard inter bank products, commercial field products, and hybrid products which often use Libor as their reference rate. In the United States in 2008, around sixty percent of prime adjustable-rate mortgages and nearly all subprime mortgages were indexed to the US dollar Libor. In 2012, around 45 percent of prime adjustable rate mortgages and more than 80 percent of subprime mortgages were indexed to the Libor. American municipalities also borrowed around 75 percent of their money through financial products that were linked to the Libor. In the UK, the three-month British pound Libor is used for some mortgages—especially for those with adverse credit history. The Swiss franc Libor is also used by the Swiss National Bank as their reference rate for monetary policy. The usual reference rate for euro denominated interest rate products, however, is the Euribor compiled by the European Banking Federation from a larger bank panel. A euro Libor does exist, but mainly, for continuity purposes in swap contracts dating back to pre-EMU times. The Libor is an estimate and is not intended in the binding contracts of a company. It is, however, specifically mentioned as a reference rate in the market standard International Swaps and Derivatives Association documentation, which are used by parties wishing to transact in over-the-counter interest rate derivatives. The rate which each bank submits must be formed from that bank’s perception of its cost of funds in the inter-bank market. The definition of "funds" is: unsecured inter-bank cash or cash raised through primary issuance of inter-bank Certificates of Deposit. The British Bankers' Association publishes a basic guide to the BBA Libor which contains a great deal of detail as to its history and its current calculation. Libor is calculated by the Intercontinental Exchange (ICE) and published by Thomson Reuters. It is an index that measures the cost of funds to large global banks operating in London financial markets or with London-based counterparties. Each day, the BBA surveys a panel of banks (18 major global banks for the USD Libor), asking the question, "At what rate could you borrow funds, were you to do so by asking for and then accepting interbank offers in a reasonable market size just prior to 11 am?" The BBA throws out the highest 4 and lowest 4 responses, and averages the remaining middle 10, yielding a 22% trimmed mean. The average is reported at 11:30 am. Libor is actually a set of indexes. There are separate Libor rates reported for seven different maturities (length of time to repay a debt) for each of 5 currencies. The shortest maturity is overnight, the longest is one year. In the United States, many private contracts reference the three-month dollar Libor, which is the index resulting from asking the panel what rate they would pay to borrow dollars for three months. In 1986, the Libor initially fixed rates for three currencies. These were the US dollar, British pound sterling and the Deutsche Mark. Over time this grew to sixteen currencies. After a number of these currencies in 2000 merged into the euro there remained ten currencies. Following reforms of 2013 Libor rates are calculated for 5 currencies. Note that the Euro LIBOR should not be confused with EURIBOR. Until 1998, the shortest duration rate was one month, after which the rate for one week was added. In 2001, rates for a day and two weeks were introduced Following reforms of 2013 Libor rates are calculated for 7 maturities. The Chicago Mercantile Exchange's Eurodollar contracts are based on three-month US dollar Libor rates. They are the world's most heavily traded short-term interest rate futures contracts and extend up to ten years. Shorter maturities trade on the Singapore Exchange in Asian time. Interest rate swaps based on short Libor rates currently trade on the interbank market for maturities up to 50 years. In the swap market a "five-year Libor" rate refers to the 5-year swap rate where the floating leg of the swap references 3- or 6-month Libor (this can be expressed more precisely as for example "5-year rate vs 6-month Libor"). "Libor + x basis points", when talking about a bond, means that the bond's cash flows have to be discounted on the swaps' zero-coupon yield curve shifted by x basis points to equal the bond's actual market price. The day count convention for Libor rates in interest rate swaps is Actual/360, except for the GBP currency for which it is Actual/365 (fixed). On Thursday, 29 May 2008, The Wall Street Journal (WSJ) released a controversial study suggesting that banks might have understated borrowing costs they reported for Libor during the 2008 credit crunch. Such under-reporting could have created an impression that banks could borrow from other banks more cheaply than they could in reality. It could also have made the banking system or specific contributing bank appear healthier than it was during the 2008 credit crunch. For example, the study found that rates at which one major bank (Citigroup) "said it could borrow dollars for three months were about 0.87 percentage point lower than the rate calculated using default-insurance data." In September 2008, a former member of the Bank of England's Monetary Policy Committee, Willem Buiter, described Libor as "the rate at which banks don't lend to each other", and called for its replacement. The former Governor of the Bank of England, Mervyn King, later used the same description before the Treasury Select Committee. To further bring this case to light, The Wall Street Journal reported in March 2011 that regulators were focusing on Bank of America Corp., Citigroup Inc. and UBS AG. Making a case would be very difficult because determining the Libor rate does not occur on an open exchange. According to people familiar with the situation, subpoenas were issued to the three banks. Additionally, some other authorities contradicted the Wall Street Journal article. In its March 2008 Quarterly Review, The Bank for International Settlements has stated that "available data do not support the hypothesis that contributor banks manipulated their quotes to profit from positions based on fixings." Further, in October 2008 the International Monetary Fund published its regular Global Financial Stability Review which also found that "Although the integrity of the U.S. dollar Libor-fixing process has been questioned by some market participants and the financial press, it appears that U.S. dollar Libor remains an accurate measure of a typical creditworthy bank's marginal cost of unsecured U.S. dollar term funding." In late September 2012, Barclays was fined £290m because of its attempts to manipulate the Libor, and other banks are under investigation of having acted similarly. Wheatley has now called for the British Bankers' Association to lose its power to determine Libor and for the FSA to be able to impose criminal sanctions as well as other changes in a ten-point overhaul plan. The British Bankers' Association said on 25 September that it would transfer oversight of LIBOR to UK regulators, as proposed by Financial Services Authority managing director Martin Wheatley and CEO-designate of the new Financial Conduct Authority. On 28 September, Wheatley's independent review was published, recommending that an independent organisation with government and regulator representation, called the Tender Committee, manage the process of setting LIBOR under a new external oversight process for transparency and accountability. Banks that make submissions to LIBOR would be required to base them on actual inter-bank deposit market transactions and keep records of their transactions supporting those submissions. The review also recommended that individual banks' LIBOR submissions be published, but only after three months, to reduce the risk that they would be used as a measure of the submitting banks' creditworthiness. The review left open the possibility that regulators might compel additional banks to participate in submissions if an insufficient number do voluntarily. The review recommended criminal sanctions specifically for manipulation of benchmark interest rates such as the LIBOR, saying that existing criminal regulations for manipulation of financial instruments were inadequate. LIBOR rates may be higher and more volatile after implementation of these reforms, so financial institution customers may experience higher and more volatile borrowing and hedging costs. The UK government agreed to accept all of the Wheatley Review's recommendations and press for legislation implementing them. Bloomberg LP CEO Dan Doctoroff told the European Parliament that Bloomberg LP could develop an alternative index called the Bloomberg Interbank Offered Rate that would use data from transactions such as market-based quotes for credit default swap transactions and corporate bonds. On 28 February 2012, it was revealed that the US Department of Justice was conducting a criminal investigation into Libor abuse. Among the abuses being investigated were the possibility that traders were in direct communication with bankers before the rates were set, thus allowing them an advantage in predicting that day's fixing. Libor underpins approximately $350 trillion in derivatives. One trader's messages indicated that for each basis point (0.01%) that Libor was moved, those involved could net "about a couple of million dollars". On 27 June 2012, Barclays Bank was fined $200m by the Commodity Futures Trading Commission, $160m by the United States Department of Justice and £59.5m by the Financial Services Authority for attempted manipulation of the Libor and Euribor rates. The United States Department of Justice and Barclays officially agreed that "the manipulation of the submissions affected the fixed rates on some occasions". On 2 July 2012, Marcus Agius, chairman of Barclays, resigned from the position following the interest rate rigging scandal. Bob Diamond, the chief executive officer of Barclays, resigned on 3 July 2012. Marcus Agius will fill his post until a replacement is found. Jerry del Missier, chief operating officer of Barclays, also resigned, as a casualty of the scandal. Del Missier subsequently admitted that he had instructed his subordinates to submit falsified LIBORs to the British Bankers Association. By 4 July 2012 the breadth of the scandal was evident and became the topic of analysis on news and financial programs that attempted to explain the importance of the scandal. On 6 July, it was announced that the UK Serious Fraud Office had also opened a criminal investigation into the attempted manipulation of interest rates. On 4 October 2012, Republican US Senators Chuck Grassley and Mark Kirk announced that they were investigating Treasury Secretary Tim Geithner for complicity with the rate manipulation scandal. They accused Geithner of knowledge of the rate-fixing, and inaction which contributed to litigation that "threatens to clog our courts with multi-billion dollar class action lawsuits" alleging that the manipulated rates harmed state, municipal and local governments. The senators said that an American-based interest rate index is a better alternative which they would take steps towards creating. Early estimates are that the rate manipulation scandal cost US states, counties, and local governments at least $6 billion in fraudulent interest payments, above $4 billion that state and local governments have already had to spend to unwind their positions exposed to rate manipulation. In 2014 the U.S. Federal Reserve Board and the Federal Reserve Bank of New York announced the creation of the Alternative Rates Reference Committee (ARRC) to assess viable alternatives to the LIBOR. In 2016 the ARRC released its first report on the possible indices that could serve as a replacement to the LIBOR. On March 7, 2018 the ARRC announced that the committee had been reconstituted and the following groups were participating. SOFR is a fully transactions based rate that will have the widest coverage of any Treasury repo rate available and it will be published on a daily basis by the Federal Reserve Bank of New York beginning April 3, 2018. Because of its range of coverage, SOFR is a good representation of the general funding conditions of the overnight Treasury repo market. As such it will reflect an economic cost of lending and borrowing relevant to a wide array of market participants active in these markets, including broker dealers, money market funds, asset managers, insurance companies, securities lenders and pension funds. The U.S. Dollar ICE Bank Yield Index is an index proposed by Intercontinental Exchange Benchmark Administration (IBA) in January 2019 to measure the yields at which investors are willing to lend U.S. dollar funds to large, internationally active banks on a wholesale, unsecured basis over one-month, three-month and six-month periods. Its usage is intended to be similar to how Libor is currently used. The administration of Libor has itself become a regulated activity overseen by the UK's Financial Conduct Authority. Furthermore, knowingly or deliberately making false or misleading statements in relation to benchmark-setting was made a criminal offence in UK law under the Financial Services Act 2012. The Danish, Swedish, Canadian, Australian and New Zealand Libor rates have been terminated. From the end of July 2013, only five currencies and seven maturities will be quoted every day (35 rates), reduced from 150 different Libor rates – 15 maturities for each of ten currencies, making it more likely that the rates submitted are underpinned by real trades. Since the beginning of July 2013, each individual submission that comes in from the banks is embargoed for three months to reduce the motivation to submit a false rate to portray a flattering picture of creditworthiness. A new code of conduct, introduced by a new interim oversight committee, builds on this by outlining the systems and controls firms need to have in place around Libor. For example, each bank must now have a named person responsible for Libor, accountable if there is any wrongdoing. The banks must keep records so that they can be audited by the regulators if necessary. In early 2014, NYSE Euronext took over the administration of Libor from the British Bankers Association. The new administrator was NYSE Euronext Rates Administration Limited, a London-based, UK registered company, regulated by the UK's Financial Conduct Authority. On 13 November 2013, the Intercontinental Exchange (ICE) Group announced the successful completion of its acquisition of NYSE Euronext. As a result of this acquisition, NYSE Euronext Rate Administration Limited was renamed ICE Benchmark Administration Limited. The appointment of a new administrator is a major step forward in the reform of LIBOR. The scandal also led to the European Commission proposal of EU-wide benchmark regulation, that may affect Libor as well. On July 27th 2017 the Financial Conduct Authority, the U.K.'s top regulator, tasked with overseeing Libor, announced the benchmark will be phased out by 2021. Carrick Mollenkamp and Mark Whitehouse, "Study Casts Doubt on Key Rate: WSJ Analysis Suggests Banks May Have Reported Flawed Interest Data for Libor", The Wall Street Journal, Thursday, 29 May 2008, p. 1. Donald MacKenzie, "What's in a Number? ", London Review of Books, 25 September 2008, pp. 11–12. ^ Note in particular that it is an estimated borrowing rate, not an estimated lending rate. The average rate is computed after excluding the highest and lowest quartile of these estimates – for much of its history, there were sixteen banks in each panel, so the highest and lowest four were removed. ^ Q&A: what is Libor and what did Barclays do to it? Archived 30 October 2014 at Wikiwix – CityWire 29 June 2012 at 17:05. ^ Zibel, Alan (30 September 2008). "Q&A: What is Libor, and how does it affect you?". The Seattle Times. Archived from the original on 11 July 2012. ^ "Barclays fined for attempts to manipulate key bank rates". BBC News. 27 June 2012. Archived from the original on 27 June 2012. Retrieved 27 June 2012. ^ a b c d "ICE Benchmark Administration (IBA) ICE LIBOR". IntercontinentalExchange. Archived from the original on 2 April 2015. Retrieved 6 April 2015. ^ "Behind the Libor Scandal". The New York Times. 10 July 2012. Archived from the original on 12 July 2012. ^ a b "CFTC Orders Barclays to pay $200 Million Penalty for Attempted Manipulation of and False Reporting concerning LIBOR and Euribor Benchmark Interest Rates". ^ a b "Barclays Bank PLC Admits Misconduct Related to Submissions for the London Interbank Offered Rate and the Euro Interbank Offered Rate and Agrees to Pay $160 Million Penalty". Archived from the original on 13 July 2012. ^ a b "Barclays fined £59.5 million for significant failings in relation to LIBOR and EURIBOR". Archived from the original on 28 June 2012. ^ a b Main, Carla (26 September 2012). "Libor Spurned, Credit Score Review, Germany's Audit: Compliance". Bloomberg. Retrieved 26 September 2012. ^ a b c d e f g h i j Anthony Browne, chief executive of the British Bankers' Association (11 July 2013). "Libor now has a new administrator – but our reforms have gone much further". City A.M. Archived from the original on 4 November 2013. Retrieved 20 July 2013. ^ "BBA Libor Benchmark Administrator's News". The British Bankers' Association. Archived from the original on 22 June 2013. Retrieved 25 July 2013. ^ a b "UK Government Policy: Creating stronger and safer banks". UK Government. 17 July 2013. Archived from the original on 17 October 2013. Retrieved 21 July 2013. ^ "UK Parliament General Committee Debates". UK Parliament. 27 February 2013. Archived from the original on 7 July 2013. Retrieved 22 July 2013. ^ a b "Financial Services Bill receives Royal Assent" (Press release). UK Government. 19 December 2012. Archived from the original on 13 January 2014. Retrieved 27 July 2013. ^ Newburg, Andre W.G. (July 1978). "Financing in the Euromarket by U.S. Companies: A Survey of the Legal and Regulatory Framework". The Business Lawyer 33(4). American Bar Association. 33 (4): 2177–82. JSTOR 40685905. ^ International Monetary Fund, Annual Report, 1981 (PDF) (Report). pp. 52–53. Retrieved 11 February 2019. ^ Finch, Gavin and Liam Vaughan (29 November 2016). "The Man Who Invented the World's Most Important Number". Bloomberg.com. Retrieved 11 February 2019. ^ "ICE LIBOR". theice.com. Archived from the original on 26 February 2018. ^ a b Schweitzer, Mark; Venkatu, Guhan (21 January 2009). "Adjustable-Rate Mortgages and the Libor Surprise". Federal Reserve Bank of Cleveland. Archived from the original on 3 May 2013. ^ Matthews, Dylan (5 July 2012). "Ezra Klein's WonkBlog: Explainer: Why the LIBOR scandal is a bigger deal than JPMorgan". The Washington Post. Archived from the original on 10 June 2016. ^ Research Economist (1 November 2013). "Meet The Team". clevelandfed. Archived from the original on 8 October 2012. ^ Popper, Nathaniel (10 July 2012). "Rate Scandal Stirs Scramble for Damages". The New York Times. Archived from the original on 19 December 2016. ^ "Welcome to bbalibor: The Basics". The British Bankers' Association. Archived from the original on 13 October 2010. ^ "bbalibor: The Basics". The British Bankers' Association. Archived from the original on 23 September 2015. ^ a b "Welcome to bbalibor: Frequently Asked Questions (FAQs)". The British Bankers' Association. Archived from the original on 12 November 2010. ^ a b c d e "LIBOR becomes a regulated activity" (Press release). The British Bankers' Association. 2 April 2013. Archived from the original on 22 June 2013. Retrieved 25 July 2013. ^ "Welcome to bbalibor: BBA Repo Rates". The British Bankers' Association. Archived from the original on 3 September 2010. ^ Wong Michael C S and Wilson F C Chan (2010), "Disparity of USD Interbank Interest Rates in Hong Kong and Singapore: Is There Any Arbitrage Opportunity? ", a book chapter in Handbook of Trading: Strategies for Navigating and Profiting from Currency, Bond, and Stock (edited by Greg N. Gregoriou), McGraw-Hill. ^ "Calculating Interest". bbalibor.com. Archived from the original on 21 June 2012. ^ Mollenkamp, Carrick; Whitehouse, Mark (29 May 2008). "Study Casts Doubt on Key Rate". The Wall Street Journal. Archived from the original on 29 May 2008. ^ Osborne, Alistair (11 September 2008). "Former MPC man calls for Libor to be replaced". The Daily Telegraph. London. Archived from the original on 9 April 2014. Retrieved 10 August 2012. ^ Flanders, Stephanie (4 July 2012). "Inconvenient truths about Libor". BBC News. Archived from the original on 9 July 2012. It is in many ways the rate at which banks do not lend to each other, ... it is not a rate at which anyone is actually borrowing. ^ Enrich, David; Mollenkamp, Carrick; Eaglesham, Jean (18 March 2011). "U.S. Libor Probe Includes BofA, Citi, UBS". The Wall Street Journal. Archived from the original on 10 July 2017. ^ Gyntelberg, Jacob; Wooldridge, Philip (March 2008). "Interbank rate fixings during the recent turmoil" (PDF). BIS Quarterly Review. Bank for International Settlements: 70. ISSN 1683-0121. Retrieved 10 July 2012. ^ "Global Financial Stability Report" (PDF). World Economic and Financial Surveys. International Monetary Fund: 76. October 2008. ISSN 1729-701X. Retrieved 11 July 2012. ^ BBC News (10 August 2012), "Libor scandal: Review finds system 'no longer viable'". ^ BBC News Online (10 August 2012), "Libor review: Wheatley says system must change". ^ Reuters (7 August 2012), "Libor collusion was rife, culture went right to the top". ^ "Britischer Finanzexperte berichtet von langjährigen Zinssatz-Manipulationen" Archived 4 January 2013 at the Wayback Machine – in German. More information, in English, is on the trader's web site. ^ Treanor, Jill (28 September 2012). "Libor: government urged to implement reforms". The Guardian. London. ^ "Libor interest rate riggers 'should face prosecution'". BBC News. 28 September 2012. ^ "UPDATE 4-UK seeks to mend "broken" Libor, not end it". Reuters. 28 September 2012. ^ "U.S. conducting criminal Libor probe". Reuters. 28 February 2012. ^ "Libor: Eagle fried". The Economist. 30 June 2012. Archived from the original on 24 July 2012. ^ Pollock, Ian (28 June 2012). "Libor scandal: Who might have lost?". BBC News. Archived from the original on 28 June 2012. Retrieved 28 June 2012. ^ "Statement of Facts" (PDF). United States Department of Justice. 26 June 2012. Archived (PDF) from the original on 15 July 2012. Retrieved 11 July 2012. ^ Reuters (2 July 2012). "Barclays chairman resigns over interest rate rigging scandal". NDTV profit. Archived from the original on 4 July 2012. Retrieved 2 July 2012. ^ "Barclays boss Bob Diamond resigns amid Libor scandal". BBC News. Archived from the original on 22 April 2017. ^ "Bob Diamond". 4 July 2012. Archived from the original on 10 February 2013. ^ Scott, Mark (16 July 2012). "Former Senior Barclays Executive Faces Scrutiny in Parliament". The New York Times. Archived from the original on 9 July 2017. ^ "Bloomberg Business". Bloomberg L.P. Archived from the original on 12 July 2012. ^ "Alternative Rates Reference Committee". Retrieved 14 May 2018. ^ "Membership for ARRC Broadened to Facilitate LIBOR Transition" (PDF). New York Fed. Retrieved 2 June 2018. ^ "ARRC Releases Second Report on Transition from LIBOR". Retrieved 14 May 2018. ^ "A scramble to replace LIBOR is under way". The Economist. 27 September 2018. Retrieved 31 October 2018. ^ "American Financial Exchange (AFX)". MarketsWiki. Retrieved 31 October 2018. ^ Alex Harris (25 January 2019). "There's a New Rival to Libor, Built by Those Who Oversee Libor". Bloomberg. ^ ICE Benchmark Administration (25 January 2019). "U.S. Dollar ICE Bank Yield Index" (PDF). ^ "Announcement of LIBOR changes" (Press release). The British Bankers' Association. 12 June 2013. Archived from the original on 23 June 2013. Retrieved 25 July 2013. ^ "Code of Conduct for Contributing Banks becomes Industry Guidance and Whistleblowing policy issued" (Press release). The British Bankers' Association. 15 July 2013. Archived from the original on 13 August 2013. Retrieved 25 July 2013. ^ "BBA Libor Limited has established the Interim LIBOR Oversight Committee (ILOC)" (Press release). The British Bankers' Association. 5 July 2013. Archived from the original on 15 July 2013. Retrieved 25 July 2013. ^ "NYSE EURONEXT SUBSIDIARY TO BECOME NEW ADMINISTRATOR OF LIBOR" (Press release). NYSE Euronext. 9 July 2013. Archived from the original on 18 July 2013. Retrieved 21 July 2013. ^ "BBA to hand over administration of LIBOR to NYSE Euronext Rate Administration Limited" (Press release). The British Bankers' Association. 9 July 2013. Archived from the original on 13 July 2013. Retrieved 20 July 2013. ^ "New measures to restore confidence in benchmarks following LIBOR and EURIBOR scandals" (Press release). European Commission. 18 September 2013. Archived from the original on 19 December 2013. Retrieved 18 December 2013. ^ "With LIBOR Dead, $400 Trillion In Assets Are Stuck In Limbo". zerohedge.com. Archived from the original on 29 July 2017. ^ Treanor, Jill (28 July 2017). "Libor interest rate to be phased out after string of scandals". the Guardian. Archived from the original on 14 May 2018.